then having them handy is a plus. I always take a drawing kit with me when I travel. If you are out of some materials, you can always find an art supply store and buy what you need. These pencils are softer and darker than H pencils (H means 'hard') and are designed for drawing, while H pencils are for writing. They are numbered 2B, 4B, 6B, etc. The higher the number, the darker and softer the lead is. To start with, I suggest you get a bunch of 2B and 4 B pencils. If you only use H pencils, drawing can become a bit tedious and frustrating, because the lines tend to be too thin and sharp, making it hard to fill up the paper. These are softer than B pencils and are great for shading and drawing outlines. Charcoal doesn't erase well, but you can smear it with your eraser or fingers to create a smoky effect. Get a few charcoal pencils. Keep some of them sharpened for drawing lines and some of them more blunt for shading. I use soft and medium grade vine charcoals for shading, and hard charcoals either for shading or controlling the edges of lines. You can use the sides or the tips for drawing. They are easy to erase and tone with your fingers or a soft brush. If you are into extremely drawing with fine lines or you want a soft touch for your drawing, then graphite pencils are ideal. I have to admit that I am somewhat biased against graphite pencils but some artists swear by them. A fountain pen adds a lot of character to your line drawings. You can vary the thickness of the lines as you draw. I often use them when I'm traveling for drawing architecture or people in cafes. You can easily incorporate inks into works with other drawing materials, like pastels, charcoal, etc. You will love to add these to your drawing supplies once you try them. 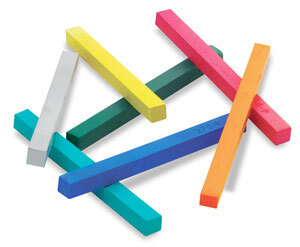 They are French made compressed charcoal sticks that come in black, white and other sanguine shades. They are somewhere in between hard pastel pencils and soft charcoals. They can be sharpened for fine tuning or used for shading. I love their sanguine series for adding colors to my charcoal drawings. Add these to your drawing supplies as you gradually build up your skills and want to add more punch to your drawings. You can get sketch pads designed for drawing in pencils and charcoal in different sizes. Most of them come in white color. Drawing paper with a mid-gray tones is usually my favorite because the gray tone of the paper serves as middle value. Therefore you can save a lot of time since you do not have to fill in the white surface. Finished drawings on toned paper usually take on a uniquely beautiful quality that I prefer to drawings done on white paper. It is cream colored and gives a nice texture to my drawings. Some pastel papers like Canson sketch papers come in different colors, shades, and textures. They are highly suitable for drawing, but they are more expensive than regular sketch pads since they are sold in individual sheets. Depending on your personal preference, you may find the texture excessive, in which case regular sketch pads or newsprint would be a good choice. For others, however, the toothy texture on the back side of the paper is the reason why they love it. It is all up to you. Another simple tool is a pencil sharpener or a razor blade. Lastly, don't forget your eraser, sanded paper pad, and a fan brush. A kneaded eraser is best for doing fine art drawing. Use a kneaded eraser to remove lines, tone down shading, or create a sharp edge in your drawings. A sanded paper pad is used to sharpen your vine charcoal. Go to a nearby art store and explore their drawing supplies. Experiment with different things. 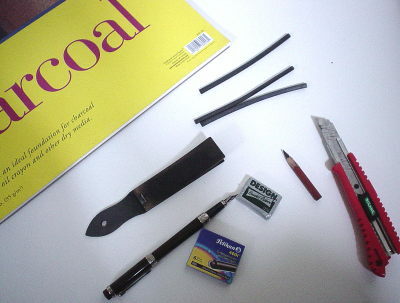 This page's suggestions cover a wide range of drawing tools. As you try things out for yourself, you will soon find a set that suits your own personal style. Whatever you end up buying, always keep a portable sketch pad and a few pencils with you, because you never know when and where inspiration will strike. Keep drawing!